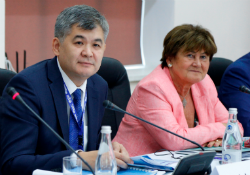 Minister of Health of Kazakhstan, Dr Yelzhan Birtanov, and WHO Regional Director for Europe, Dr Zsuzsanna Jakab. Experts convened in Almaty, Kazakhstan, on 20–21 June 2017 for the inaugural meeting of the Primary Health Care Advisory Group. The WHO Regional Director for Europe launched the Advisory Group to advance primary health care in the WHO European Region. At its first meeting, the Advisory Group engaged in discussions on the readiness and responsiveness of primary health care to embrace future health and social needs. In her opening remarks, WHO Regional Director for Europe Dr Zsuzsanna Jakab thanked the Government of Kazakhstan for its generosity and leadership, which has made possible unique platforms such as the Advisory Group. The WHO European Centre for Primary Health Care, which is hosted in Almaty by the Government of Kazakhstan, is the Secretariat of the Advisory Group. Dr Jakab reminded participants of the essence of the visionary Alma-Ata Declaration of 1978, which emphasized the need to bring a holistic perspective to health while organizing services close to people’s homes. In her speech, Dr Jakab reflected on the needs and context of primary health care over the 40 years since the Declaration. “One thing is certain: transformation is needed. This transformation demands intersectoral action. It calls for partnerships and new relationships, as patients and populations become increasingly engaged. It also calls for new forms of relationships among health providers, and between communities and local, regional and national authorities,” she explained. Minister of Health Dr Yelzhan Birtanov, who attended the meeting, remarked that WHO’s role in health systems strengthening is highly valued. “This inaugural meeting is a unique opportunity to hear from other countries, and to share opinions with international experts in primary care,” he said. The Minister stressed that primary care clinics are key to tackling noncommunicable diseases. He added that Kazakhstan is working towards bringing primary care closer to populations, and improving polyclinics to better serve patient needs. Over the next years, members of the Advisory Group will use their expertise to advocate for the strengthening of primary health care. They will facilitate collaboration with relevant sectors, partners and stakeholders, and provide a forum for sharing technical experience and knowledge. integrating primary health care and social care, particularly due to the rising needs of the growing elderly population.